The civil engineering sector accounts for a significant percentage of global material and energy consumption and is a major contributor of waste material. The ability to recycle and reuse concrete and demolition waste is critical to reducing environmental impacts in meeting national, regional and global environmental targets. Handbook of recycled concrete and demolition waste summarises key recent research in achieving these goals. Part one considers techniques for managing construction and demolition waste, including waste management plans, ways of estimating levels of waste, the types and optimal location of waste recycling plants and the economics of managing construction and demolition waste. Part two reviews key steps in handling construction and demolition waste. It begins with a comparison between conventional demolition and construction techniques before going on to discuss the preparation, refinement and quality control of concrete aggregates produced from waste. It concludes by assessing the mechanical properties, strength and durability of concrete made using recycled aggregates. Part three includes examples of the use of recycled aggregates in applications such as roads, pavements, high-performance concrete and alkali-activated or geopolymer cements. Finally, the book discusses environmental and safety issues such as the removal of gypsum, asbestos and alkali-silica reaction (ASR) concrete, as well as life-cycle analysis of concrete with recycled aggregates. 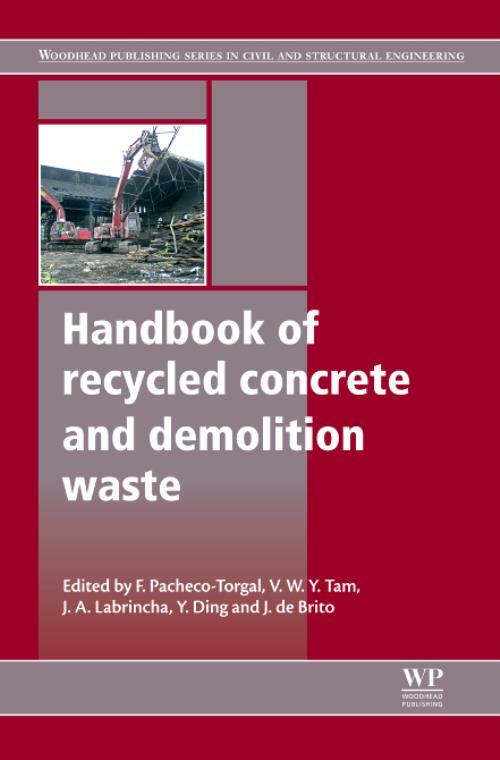 Handbook of recycled concrete and demolition waste is a standard reference for all those involved in the civil engineering sector, as well as academic researchers in the field. 5.3 Geographical areas defined in the case study in Cantabria, northern Spain. 5.6 Sensitivity analysis of the ranking of C&DW facility location alternatives to the criteria weightings with different MCA methods. 5.7 I nfluence of uncertainty on the ranking of C&DW facility location alternatives with different MCA methods. Ding, YiningYining Ding is Professor in the Institute of Structural Engineering at Dalian University of Technology, China. He has published over 100 papers in three languages.